After continuing our journey with John Crichton last week with “The Choice” and “Fractures”, our Farscape re-watch continues this week with the nineteenth and twentieth episodes of Season 3. Although the episode after this one is officially listed as a two-parter with the one that follows it, I have always considered “I-Yensch, You-Yensch” to be the first of a four-part episode that includes it, the “Into the Lion’s Den” episodes, and the season finale “Dog with Two Bones,” or possibly even the second of a five-part, if you count “Fractures,” which sets this arc into motion. At the same time, I rather like that it has its own self-contained story that on another show might seem like a diversion but which is also actually crucial in a number of ways: thematically, character-wise, and even from a simple building-tension perspective. The basic thrust of the A-plot is that D’Argo and Rygel are meeting with Scorpius in order to negotiate a truce between Crichton and him, whereby John would agree to join him on his Command Carrier and allow him access to all of the wormhole knowledge he has (they know from the melting scientist in “Incubator” that Scorpy’s team hasn’t been able to to crack it) in exchange for the promise of safety for John and his friends. What they convey to Scorpy is that Crichton would rather the Peacekeepers have the tech than the Scarrans, although his real reason for wanting on the base, of course, is actually to destroy it. Scorpius’ solution to guarantee Crichton’s survival is an I-Yensch bracelet, a technology that links two separate peoples’ neurological receptors so they both feel one another’s pain. If one gets shot, the other will feel it. If one hits his head, the other will feel it. If one dies, the other will, too. Scorpy, however, proposes linking Crichton to Braca, which is a no-go with Rygel and D’Argo, who know that Scorpius wouldn’t hesitate to kill his second-in-command if the situation required it. He is unwilling to bend and wear it himself, however, and so the deal is about to fall apart when the diner where they are meeting is suddenly under attack by two alien creatures who seem to be half-rat/half-monkey (they have rodenty faces, noses, and ears, but also a penchant for making simian noises when they’re upset). At first, they seem to have randomly decided to hold this place hostage until the truth comes out: the cook/owner had actually hired them to burn the place down, in exchange for a large cut of the insurance money for them, but when they discover top-ranked Peacekeepers and a Hynerian royal there, they decide to change the deal and instead hold them for ransom. 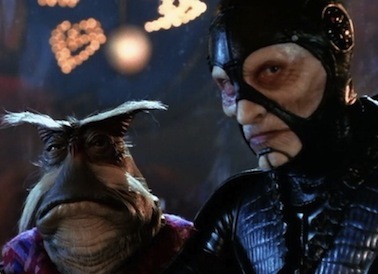 What follows is effectively Farscape‘s twist on a Tarrantino or Coen Brothers film, with events surrounding what was supposed to be a simple crime spiraling rapidly out of control, and with enemies Rygel and Scorpius at different points going from sabotaging one another to collaborating as allies, when it suits their purposes. This proves to be a wonderful plot for numerous reasons. Firstly, it is such a Farscape case of bad timing that Rygel and D’Argo would be holding this meeting with Scorpius and Braca only for all of them to find themselves accidentally caught up in this pair of dolts’ petty attempt to strike it rich. While they are negotiating for terms that might have a sizeable impact on the fate of the entire galaxy, these two criminals wander in and nearly ruin everything, with no awareness of the significance of what is happening here, which creates a brilliant dissonance between the space opera that our friends and enemies are involved in and the crime film unfolding in this divey restaurant. Secondly, it’s one of Rygel’s greatest episodes, with nearly an entire story revolving around his formidable negotiation skills. It’s at times like this where we are afforded a true glimpse of what he might have been like as a Dominar, and, tiny stature be damned, he is impressive and fiercely capable, both in speaking calmly and wisely to these idiots, and in demonstrating his willingness and ability to get his hands dirty when the situation calls for it. He skillfully allies himself with Scorpius (a sequence that includes the finally! moment of Rygel farting helium near Scorpy) and moments later shoots him to prove his lack of loyalty to the Peacekeepers, shortly afterwards revealing that he had only done so so they would assume Scorpius was dead in order to launch a surprise attack. When Scorpius asks him how he knew he was wearing armor, he replies, “I wasn’t sure, but 131 cycles in Peacekeeper captivity teaches you a few things.” “What if you were wrong?” Scorpius asks. “Not so bad for me, either way,” he cheekily replies, a position that Scorpius can’t help but respect. They then work together to take out the baddies, which sets up Scorpy’s ultimate agreement to acquiesce to his demands and wear a bracelet along with Crichton, and also obliquely foreshadows his unlikely alliance with Moya’s crew in the next season. Meanwhile, the tension of the hostage perdicament is further punctuated by D’Argo and Braca’s bond, which ranges from slapstick to deadly serious and back again. At first, it’s funny that D’Argo can hit himself and hurt Scorpy’s sycophant but when the very volatile thieves barge in and D’Argo and Braca’s shared reactions only seem to exacerbate their anger and nerves more, the situation becomes further fraught. But even with that, the show’s brilliant control of tone is such that it can effortlessly veer from suspense to humor and back again throughout the ordeal. Furthermore, it is grounded in real-world emotion through the characters of the owner/cook and the waitress/girlfriend. He became involved with these shady people in order to give her the better life he believed she deserved, and he ends up being killed in the process, breaking her heart. The fact that, even in the midst of this action-film and sci-fi outlandishness, the show takes time to present this tragic story and to spend some time with these one-off characters, arguing for their importance in their own life stories, if not the larger Farscape saga, reiterates the series’ humanism and belief that every life matters. In some ways, they come to indirectly stand for the 599 faceless victims who perish on the medical ship, at the hands of Talyn. At the start of the episode, the only remaining member from the escaped transport pod in “Fractures,” the Scarran, who has struck up a friendship with Jool, is planning to leave on said PK med ship, and Jool plans on going with him, in order to receive medical attention for her eye, which was damaged by flying Boolite bits, and to hopefully afterwards find her home. Of course the first (and only?) sympathetic Scarran on the series would tragically die. Chiana stops Jool from joining the ship by knocking her unconscious, after receiving a vision that she believed was of her mourning Jool’s death but actually turned out to be for the deaths of everyone else aboard the med ship. The reason is that, moments after the ship rendezvouses with Moya, takes the Scarran on board, and begins to fly away, two other PK vessels, completely unrelated to that ship, appear out of nowhere to attack Moya, and Crais commands Talyn to destroy them; however, Talyn has grown so paranoid and fearful that he somehow misinterprets the med ship as a threat, too, and he decimates it, along with the 600 souls aboard it–which stuns everyone speechless. Everyone, that is, except for Jool, who is furious, attacking Crais for not stopping Talyn. This is a fantastic use of her character, because it is one of the rare times that no one can argue that she is wrong. Everyone else aboard Moya is too close to Talyn to have full perspective, because they were there since the day he was born and love him, but Jool has no reason to have that sort of connection. All she cares about is that he has just butchered 600 innocent people, and her pain, anger, and horror, having lost a new friend in addition to the others she never met–why, she was almost a victim, herself–helps us as viewers feel it, as well. And that is when Crais finally voices something he’s probably been thinking for a long time. Talyn’s issues run far deeper than being a bit screwed-up. He has grown increasingly mentally unstable and dangerous. The signs have all been there, from his destruction of the Halosian and Plokavian ships in “Out of Their Minds” and “The Ugly Truth,” respectively–they both turned out to be dangerous to varying degrees but particularly in the latter case, it’s impossible to fully justify it–to his homicidal behavior against Crichton and torture of Crais in “Green-Eyed Monster” to his inability to control himself and his fears in “Infinite Possibilities”. In some ways, he was always a ticking time bomb, a very young being at war with himself due to his conflicting ingrained instincts, and unfortunately loaded with a terrifying number of deadly weapons. And now he has finally taken an emotionally driven, reactive action that has cost a huge number of lives, due to misread signals and paranoia. Crais argues that Talyn’s mind is too broken to carry on as it is. Unfortunately, there’s no such thing as therapy for such a unique creature as he is, arguably one who should never have been created in the first place. The only feasible solution is to shut down all of Talyn’s higher functions and basically create a new mind for him. He’ll still be alive but with an entirely new personality. Talyn, as they know him, will be no more. Ironically, the very thing that they were trying to prevent Xhalax from doing back in “Relativity” might be the only way to save Talyn–and countless others he may cross paths with in the future–now. Naturally, this is a horrifying thing to consider, and, as should be expected, at first, Moya won’t hear of it, rumbling with anguish whenever the subject is brought up. Moya has always been a very real character on the show but arguably here more than any time before it. Regardless of her inability to speak, the show manages to brilliantly convey that she is a mother whose heart is breaking, both due to what is being considered as well as the fact that, on some level, she realizes it must be done. At first, however, she refuses to admit it, which inspires Aeryn to speak to John willingly for the first time since returning to Moya, which alone is hugely significant, because in a time of great pain for her–remember, she has been Talyn’s surrogate mother of sorts herself, since the beginning, and had given him his name–she seeks the wisdom of her friend who happens to be identical in every way to the man she loved, who, she will even finally admit by the end of the episode, is him. But on some level now she knows what a kind, empathetic, and wise-in-the-ways-of-the-heart person Crichton is, just as hers was, and she wants his advice. And, just as he did all the way back in “They’ve Got a Secret, he suggests that someone has to talk directly to Moya, but that it shouldn’t be him but Aeryn, who Moya knows loves Talyn just as much as she does–an extremely perceptive call and one fully devoid of ego or pride on his part. Overall, Crichton is a surprisingly passive player in this episode, but it makes sense to give the character a brief rest after all he had gone through earlier in the season and before the intense focus on him in the last three of the season. AERYN: Talyn, you listen to me. You destroyed a ship with many innocent souls on board. You shot your own mother. You would never do that unless you were sick and frightened. When Moya told you what we had to do, you panicked and struck out. I don’t think you really meant to hurt Moya. You could have destroyed her if you wanted to, but you didn’t, just as I’m hoping that you don’t really want to hurt us, because we don’t want to hurt ou. Talyn, you know you’re sick. You let us board. Now, I don’t want you to be frightened. You’re not going to die. You’ll be reborn. It’s a fresh start. Please, Talyn, let us take away your pain. It’s a beautiful, deeply felt moment, and you can tell that Aeryn’s heart is breaking throughout it, despite knowing the necessity of it. Crais backs her up by calling Talyn “very brave” for doing this, and he certainly is, although we know that he ultimately won’t get this second chance at life. He and Crais, however, will both find a way to truly redeem themselves in “Into the Lion’s Den,” Part II. For now, however, the dead silence that follows after all of Talyn’s major systems are shut down is just gutwrenching. What all the characters are feeling reflects the I-Yensch bracelets: shared pain. This leads into the final scene, in which Aeryn finally acknowledges to John that he and Talyn-John were one and the same. That doesn’t, however, mean she’s ready to embark on a relationship with him, but it is to say that she had seen him die once while trying to save wormhole knowledge from an evil military force, and the idea of seeing him doing it again terrifies her all over again. At the same time, she will go with him. The futility of the situation is quite fascinating. They are going into this, eyes wide open, fully expecting to not come out alive, just as Aeryn had belied Crichton’s ghost’s claim that “you never think you’re gonna die” in “The Choice”. But that’s what makes them heroes. Death isn’t only a possible outcome to this endeavor. It seems the only feasible one. I can’t believe we’ve finally made it to “Into the Lion’s Den” two-parter, easily among the most epic episodes of the entire series, so far-reaching and ambitious in narrative scope that, with a larger budget and wider aspect ratio (which the series would finally get in the fourth season), it would have been more than worthy of being aired on the big screen. Even as it is, it feels damn impressive, and it can be easy to forget you’re watching an episode of television rather than a blockbuster sci-fi film. This sense grows all the more in the second hour–which I’ll be covering here next week–thanks to its multiple levels of literal and dramatic explosiveness. After nearly two seasons of Crichton desperately trying to avoid Scorpius at all costs and nearly three seasons of all of them desperately fleeing the Peacekeepers, “Into the Lion’s Den” chronicles what earlier would have been unthinkable: the story of John and his compatriots willingly boarding a command carrier, with the ostensible agenda of actually helping Scorpius with his wormhole research. In return, Scorpy grants them all full immunity while on board the ship, along with a number of other requests: for D’Argo, a file on Macton, his Peacekeeper brother-in-law who murdered his sister/D’Argo’s wife, Lo’laan, including current location; for Rygel, information on the current Hynerian political system (he is delighted to learn that the cousin who had betrayed and ousted him, Bishan, is currently falling out of favor); for Crais, help in removing all of Talyn’s weaponry and giving him a tabula rasa personality rewrite, which would effectively allow him to simply be a redesigned Leviathan. And over the course of their stay, some fascinating things happens. For starters, Scorpius actually behaves obsequiously towards John and his friends, with an outward show of friendship and compliance to all of their wishes. After trying and failing to force the information out of Crichton in the past, now John seems to be willing to help of his own accord, and although Scorpy has his suspicions and doubts, he realizes that the best course of action, at least at first, is to appease Crichton, who seems to hold all the cards. Scorpius has the majority of wormhole knowledge copied from Crichton’s brain already and knows he can’t get any more out of John through torture. Besides the human’s strong resistance, the missing wormhole data is buried too deep inside his subconscious for even the Aurora Chair to get, and furthermore, due to the I-Yensch bracelet, isn’t even an option. John has to, instead, access it on his own through working on the problem, and so Scorpius, up until the end of the episode, tries to facilitate those circumstances. What he is referring to is Commandant Mele-On Grayza, the terrifying, high-ranking PK official who is set to take Scorpy’s place as Big Bad of the next season and who makes him seem like a pussycat in comparison. From the moment she marches on board, she acts as if she owns the place, brazenly disregarding Scorpius’ orders and even capturing Moya and reimprisoning John’s friends after they returned to their ship in the wake of the attack on D’Argo. Grayza is a brilliant villain, beautifully brought to life by Rebecca Riggs, who manages to convey dominance, contempt, and precision with her every word and motion, and who is an ingenious addition to the saga due to how she puts Scorpy’s level of power into perspective. Before, we might have thought that Scorpius was at or near the very top of the chain of command, given his top-secret, “billion-dollar” (or the Sebacean equivalent) programs, but she, for the first time, makes us realize another reason that Scorpius has been so desperate to get the wormhole tech working ASAP, and that is that not all of High Command agrees with him that they are the way to go (not to mention that his repeated inability to capture one person and a small crew of escaped prisoners has been making him look weak). There are some bureaucrats like Grayza who instead want to attempt to forge a truce with the Scarrans. She seems determined to have Scorpy’s work dismantled and his argument for its necessity discredited. The Luxans, to D’Argo’s horrors, are even considering allying with the Peacekeepers, in order to help demonstrate their combined strength as a bargaining tactic in the negotiations with the Scarrans. Of course, the hubristic Grayza is actually more interested in aggrandizing herself as the person who helped facilitate this peace than in anything else. And so it’s difficult for Crichton to not start seeing Scorpy as a potentially lesser evil, particularly since (a) he’s right; believing the Scarrans would honor a truce is naive at best, monumentally stupid at worst; odds are, as he says, that all it would do is put the PKs in an even weaker, more vulnerable position as before; and given that Scorpy is half-Scarran himself and was raised by them, he possesses a knowledge and sense of them that Grayza could never have; and (b) Scorpy repeatedly goes out of his way to help John, ultimately freeing his friends, regardless of the political ramifications from Grayza. And before she returns with orders from High Command, she attempts to get her revenge on Scorpius sooner by secretly communicating with a spy of hers, the bigoted captain from earlier, and suggesting that he should have Crichton assassinated, which, thanks to the I-Yensch bracelet, would kill two birds with one stone. She’s particularly enraged at John now for his having had the nerve to point a gun at her. That’s all it takes to get on her bad side: question her absolute authority (the bits of her far-humbler background that we later learn add some interesting layers to this). John and Aeryn just barely survive an attack in the generator room, in which John is nearly burned to a crisp, the reddening of his face near the glowing energy a subtle parallel to the other John’s death by radiation. He nearly dies trying to save the world from enemies wielding wormholes, as well. It’s a truly stunning, intricate sequence that includes Crichton and the bad guy on jetpacks a la The Rocketeer and a brilliant fusion of genuine suspense that also pays homage to action pulp serials of yesteryear, made all the more tense by the cuts to Scorpius who, in his room, is suffering every blow that John is receiving. And that leads directly to the episode’s ultimate irony: just when John is seriously considering that perhaps he shoud help Scorpy, Nosferatu turns on him, accusing him of deliberately stalling or attempting to sabotage the project, attacking John by stabbing himself in the wrist, and revealing his ace in the hole: Earth. By using John’s memories from the neurochip, he had his team triangulate Earth’s position, which can be reached in 60 cycles, at top speed, and if John doesn’t help him, he promises that he will keep him alive to see the day that he destroys his home planet. And although Scorpy does this to get the results he requires, it is also very likely the moment that convinces John that, no matter the PK vs. Scarran politics, Scorpius cannot be trusted. Scorpy really can be his own worst enemy. –One of the episode’s most intelligent continuity details is its explanation for how Scorpius is unable to tell via reading Crichton’s heat signature that he is lying to him–an ability that we learned about in “Incubator” and would thus otherwise have been a pretty major oversight. And the answer is Harvey, who is regulating Crichton’s internal temperature in order to mask that he is lying. The awesome thing about Harvey’s gradual development is that, by this point, he has basically become a completely self-actualized person rather than simply being subservient to Scorpy’s whims or desires. He has realized over the course of the season that his desire to live outweighs any loyalty he “should” be feeling to Scorpy. What he knows is that, if Scorpy learns the truth about Crichton, he will kill him–perhaps not today, due to the I-Yensch bracelet, but eventually–and Harvey will die along with him. Harvey wants to live and therefore helps John out and, by extension, himself (the other Crichton’s Harvey was also motivated by this desire, but lashed out at Aeryn in an attempt to convince her to kill them both when he found no other way to preserve himself, indicating that he only helps John inasmuch as it helps him). The biggest irony with that is that, although he’s working against the “real” Scorpius now, in many ways, he’s also acting exactly as Scorpy would in this situation, taking note of which way the wind is blowing, and doing whatever he can to keep himself alive. –I always loved the recreational area on the ship that is a simulation of an outdoor park on a sunny day. Visually and conceptually, it’s so cool to see this sunlit, green, outdoors, seemingly fresh-air space located within the cold, hard, dark, metallic environs of a PK command carrier. –Another display of Chiana’s powers: she foresees Pilot screaming shortly before Grayza’s people attack Moya. –Aeryn gets a fantastic subplot in this one, as well, and one which largely feeds into her decision to join PK black ops in the season finale. Although Jool looks around at what seems like a dismal environment and assumes aeryn’s life as a PK must have been awful, Aeryn gives us another perspective: the camaraderie she felt as a soldiers and the friendships she shared. She may have ultimately come to see that they were fighting for an evil cause, but back in the day, her experience on a one-on-one basis with her fellow soldiers was often a positive one. This is why what happened to Aeryn in Season 1 was such a terribly difficult adjustment. For the average PK soldier, life is actually quite comfortable, if possibly lacking in ways they can’t ever comprehend unless they ever leave, as Aeryn did. She even reunites with a former friend of hers who she is thrilled to see, the friend less so, throwing a drink in her face when they first meet again. But this woman is far from evil. She just has spent her life buying into the party line that she was raised to follow, and she sees Aeryn’s abandonment of the PKs and her as a betrayal. As far as the latter, the slashy vibe seems deliberately placed. I don’t expect that Aeryn was actually a lover of hers, but I wouldn’t be surprised if this woman carried these feelings for her. The hurt seems far more personal than just shock that her friend could leave their military. What’s particularly interesting, however, is this woman’s implication that Aeryn could have come back after Crais was thrown out. It’s something that we probably never considered before but which makes perfect sense. And, as it turns out, Aeryn had realized it, but, as she tells her friend, it was too late by that point. She had already experienced life as a free woman for too long to be able to go back, blindly adhering to PK rules. She does open up her friend’s eyes a small bit, though, first by telling her how she still lives her life according to some of the major ideals that the PKs had ingrained in her, such as trust, loyalty, and honor–which reiterates that, at their heart, PKs as a concept are not awful; they have just become corrupt, as any huge military police force eventually would; and, remember, it’s important to Aeryn to hold on to that fact (as evidenced in “…Different Destinations,” that the PKs originally started as an altruistic organization, so as not to throw out all of the good aspects of the earlier part of her life–and then by asking her gently whether there might be some in command not worthy of her respect. That seems to be something that she can understand.